Hi babes! Can’t believe how fast the past few months went by but it’s almost time for the happiest time of the year: Christmas!! Ever since I was a child, I used to make calendars 2 months before Christmas eve to start counting the days. Cute huh? 😉 It was just the combo of good food, being together with the entire family and the presents which made this night so special and magical to me. And next to the super fun part of being able to dress up for all the end of year festivities, there is also the gift shopping! Because I enjoy the shopping for my loved ones even more than shopping for myself! 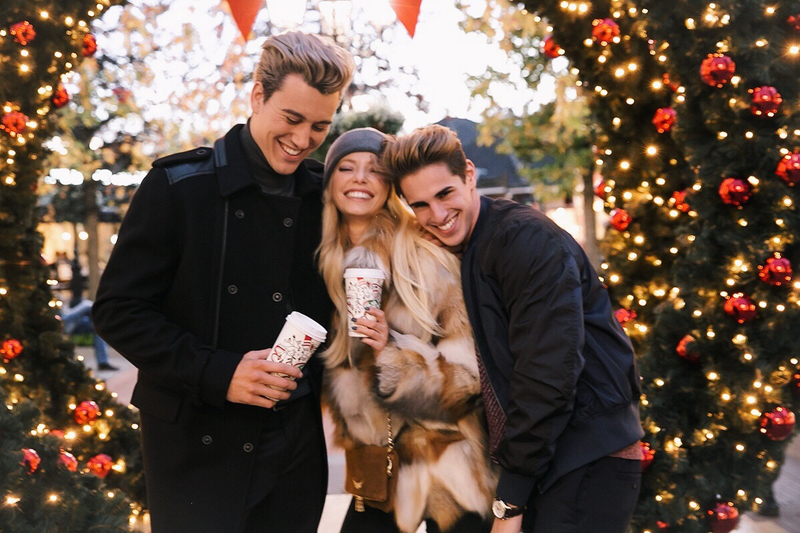 Last week, Matthias and Denzel and I met up at McArthurGlen Designer Outlet Roermond for some holiday outfit selecting for ourselves but also to compose the perfect gift guide for you! 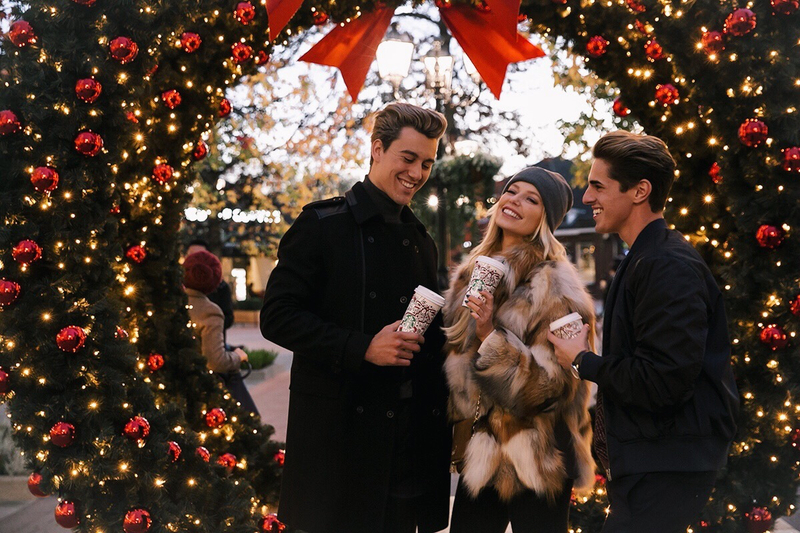 Because whether you are looking for something special for your mother, father, brother, aunt or BFF, McArthurGlen Designer outlet Roermond has it all! Remember when I guided you around and told you about al their shops and brands here and here? Well, even a lot more designers and shops were added, yay! Now let’s talk outfits shall we? I fell head over heels for this black and white look, which I can totally see myself wearing for a December dinner, party, shopping spree or everything in between. I picked some black embroidered trousers and leather lammy coat from Anne Fontaine and put a white silky top with lace details from Sandro underneath. And a look wouldn’t be finished without the right accessories! 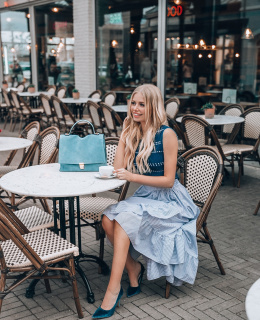 I love how you can find so many high end bags and shoes which are timeless at McArthurGlen Designer Outlet Roermond! 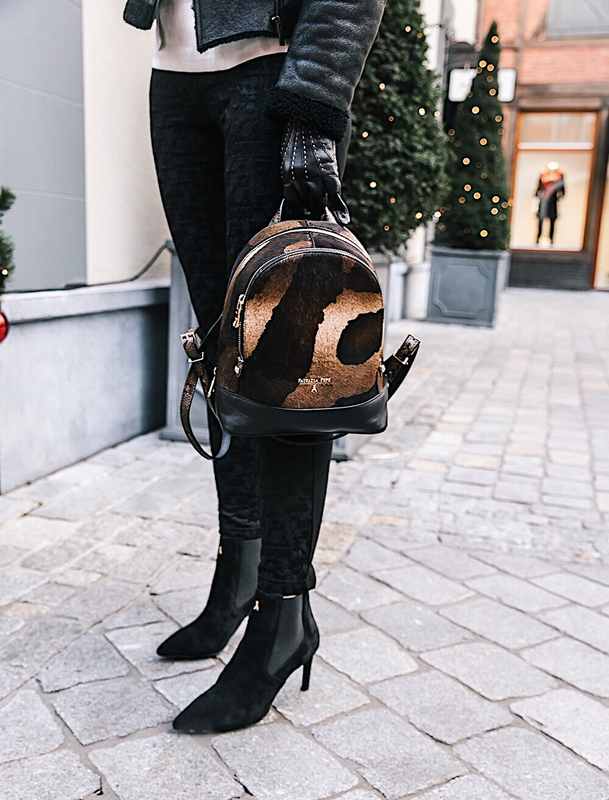 I went for some black heeled suede booties and mini camo backpack from Patrizia Pepe. I’ve been such a big fan of this Italian brand for years now so I was very happy with their addition to the shop portfolio. Over my shoulders, I’ve put on the prettiest Karl Lagerfeld faux fur stole with iconic ‘Karl’ print, so chique. And the delicate Zadig & Voltaire ‘Love’ necklace comes peeking around my neck. I finished the look with some nice black leather gloves from Armani to keep my hands warm when it’s freezing. Next up was an even more festive look, perfect for NYE don’t you think? I went for a long lace maxidress from Maje, so chique yet youthful thanks to the shorter dress underneath. The black biker perfecto adds a little touch of rock&roll to the ensemble. I went for the coolest Karl Lagerfeld (can you tell I adore the French ‘je ne sais quoi’ of this brand) little case bag in silver and gold stars and glitters. On my wrist are the gorgeous coloured enamel bracelets from FreyWille. The carroussel located in the shopping area made the perfect backdrop for this evening look. 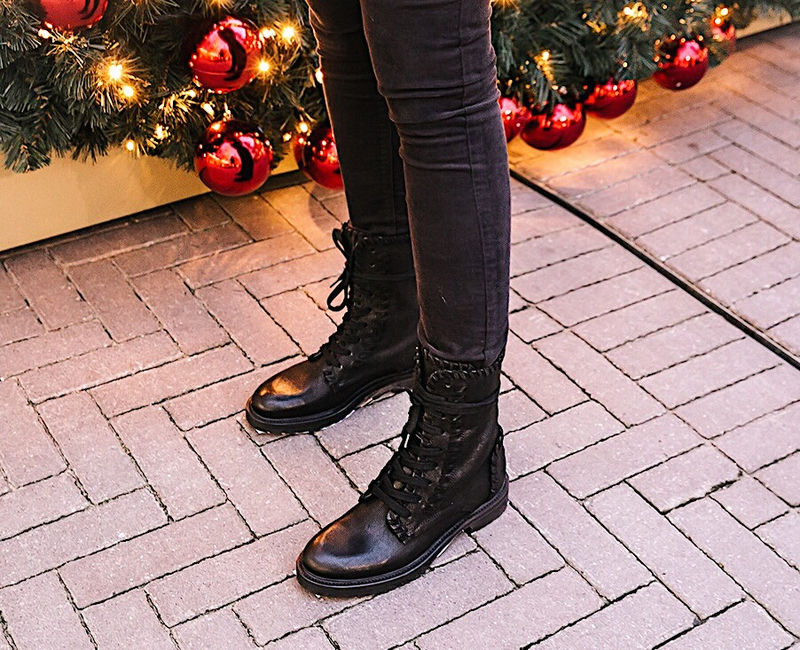 And last but not least, I wanted to show you guys my absolute favourite look for cozy Christmas market evenings. It was love at first sight for this fur Zadig & Voltaire patchwork coat! The fit, the colours, the material; I’m hooked! This statement coat asked for some high quality basics to finish the look: a skinny jeans, Maje grey hat and some Kennel & Schmenger tough black biker boots. 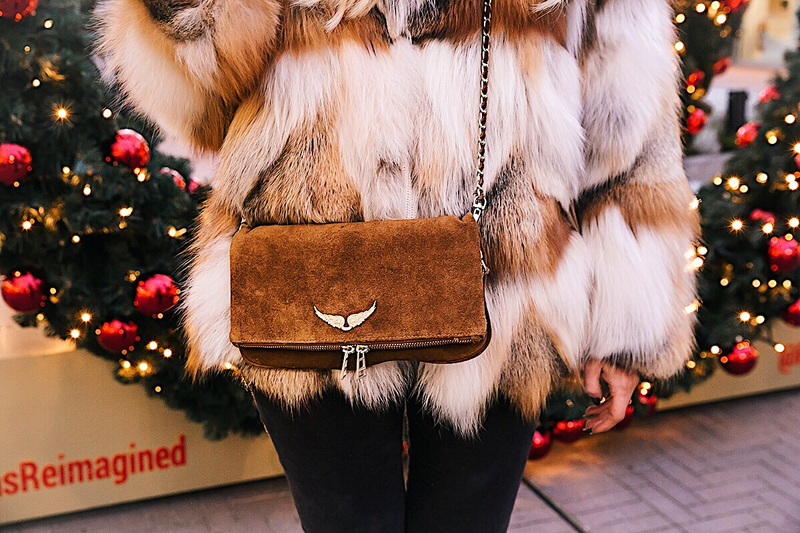 The camel coloured suede bag with gold chain went perfectly with the colours of the coat. I went for a quick make-up touch up at the recently opened store of famous cosmetic brand NYX. So ready for the colder days with this look! 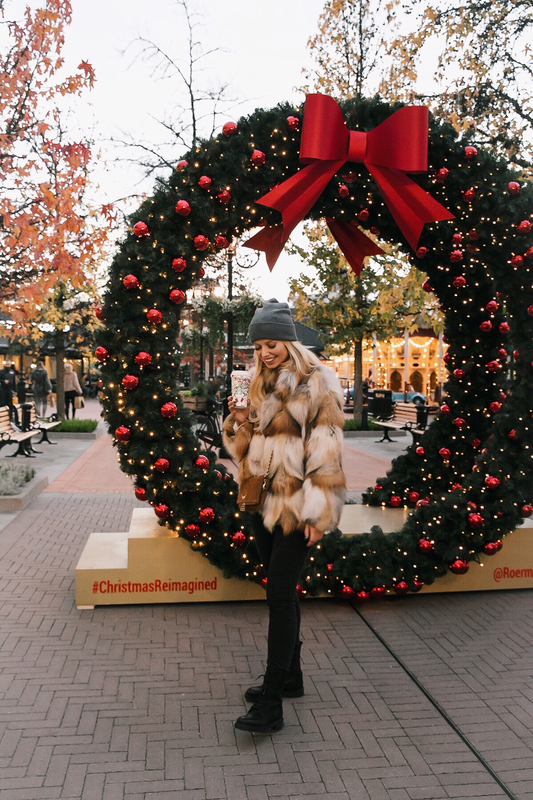 The magical Christmas decorations, already up in McArthurGlen Designer Outlet Roermond made the whole shopping experience even more cozy! Hot gingerbread latte, some chocolate topped churros and we were good to go! All items shown available at McArthurGlen Designer Outlet Roermond (Stadsweide 2, 6041 TD Roermond, Nederland).